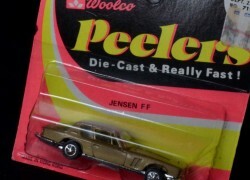 Item description: An elusive Play Art (peelers) scale model toy of the Jensen FF in metallic fawn. Complete with original packaging. Circa 1969. Background to Play Art: Playart was a toy company owned by Hong Kong industrialist Duncan Tong. The company specialized in die-cast cars, similar in size and style to Hot Wheels, Matchbox or Tomica. The cars were generally concidered well made for their scale (1.64), Play Art toy cars were made from 1965 to 1983; at the factory in San Po Kong, Kowloon, Hong Kong. 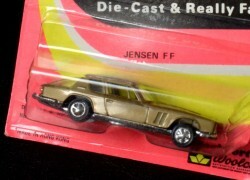 Plastic cars and trucks of 1:43, and 1:24 scale were also made, and it is possible some of these were branded as Blue Box. various stores had the Play Art range packaged with their own preferred brand alongside Play Art, such as Peelers, Road mates, Fast Wheels etc. 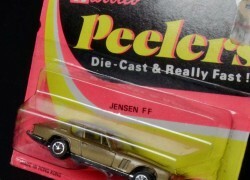 Special notes: The Museum holds a large collection of Play Art Jensen FF models in various packaging and colours. We are always interested in examples we do not hold.